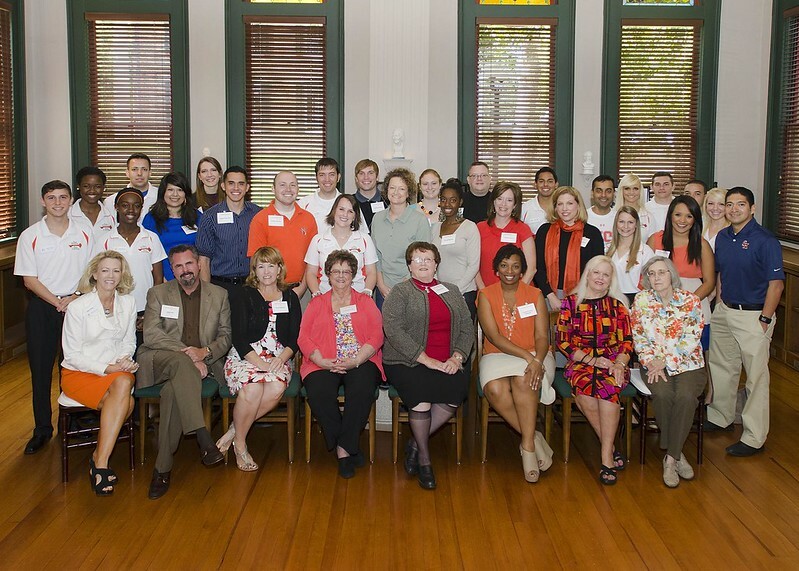 As one of the oldest service organizations on campus, the Orange Keys have grown greatly since inception. Remembering the original founder of SHSU's Orange Keys — Diane Holland. Orange Keys are one of the oldest service organizations at Sam Houston State University. Seen on campus greeting guests at SHSU events, members act as the official ambassadors of SHSU and serve as hosts for university functions such as banquets, luncheons, meetings, speakers, visitation days and career fairs. Originally founded in 1959 as a leadership organization for women, Diane Holland, an education major and journalism minor from Tomball, Texas, created the group to utilize the many talents of the female students at SHSU. Holland believed that if members had the qualities needed to be an Orange Key, they would have them for life. The name Orange Keys was chosen because a key is known to unlock doors and open the gate to opportunity. Their motto, “unlocking the potential in the leaders of tomorrow” serves as a testament that members of this elite organization will go on to do great things. Men did not join Orange Keys until 1982 when they accepted five males into the group. The first male president, J. David Hall, a communications major from Lubbock, Texas, was elected in 1985. Hall believes his time serving as president was a privilege and reflects on the great time in his life. Today, Orange Keys is composed of 18 upperclass students and selection to this prestigious group is recognized as one of the highest honors a student can achieve at SHSU. Service, leadership and academic excellence are the foundations of this elite organization. Diane N. Holland (’60) was a woman of many talents and abilities. During her time at Sam Houston State University, she was active in numerous organizations including being the original founder of Orange Keys and a cheerleader. Holland later served the Greater Tomball Area Chamber of Commerce as its president from 1973 to 1993 and participated in leadership roles as a member and official of countless city non-profit organizations. Holland even coined the city’s slogan, “Tomball, Hometown With A Heart” which is still in use today. After retiring from the Tomball Chamber, she later returned to work for Klein Bank from 2000 to 2004, and then as Project Manager in Community Relations for Lone Star College from 2004 to 2007. Holland also worked as President of the Magnolia Parkway Chamber of Commerce from 2008 to 2012 and served for eight years as an elected City Council member for the City of Tomball.